Hey there!! It has been a blustery beginning to my week! Snow sideways most of my Monday! With it being Tuesday we all know what that means.... 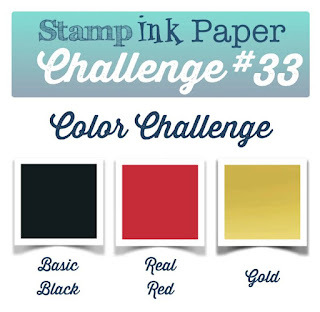 Stamp Ink Paper! I am sure that we are all in full blown Valentine making mode! Me?! I honestly am trying to put my best foot forward! Hearts are probably my least favorite shape LOL! Not something I own a lot of... Thankfully we have a beautiful color challenge for you! I can't wait to show you what I have made! Wow!!! At least that is what I think when I made this card. It is VERY dramatic for me! The colors lend themselves to a dramatic card. The card base is Very Vanilla Card Stock with a simple matte of the stripe from the Timeless Elegance DSP. You will notice a nice gold foil banner off to the left there. 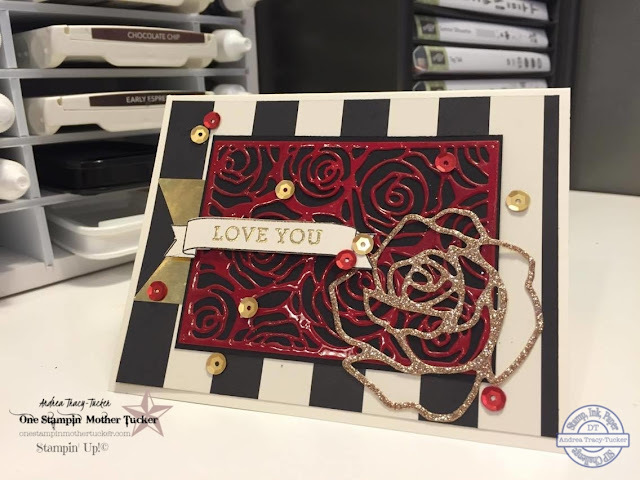 I will be honest last spring I was in love with the Artisan Embellishment kits laser cut rose panel. I stumbled on a die that cut the same pattern! So I simply cut this out of Real Red card stock heat embossed it with clear Stampin' Emboss powder. I adhered this with the two way glue pen onto a Basic Black background and then glued this over the gold foil banner.... Now I will be honest, this is where things got a little tricky! I wanted to use my "Love" from my retired Expressions Thinlits. Apparently it is MIA in my craft room... I used the lovely Die and Banner Stamp from the Number of Years Bundle. I stamped the banner with the Basic Black Archival Ink and then use Gold Stampin' Emboss powder for the Heat Embossed "Love You" from the Bloomin' Love set. The Champagne Rose from the Rose Garden dies and Hello December Sequins gave this card just the right amount of class it needed!